Looks fantastic on my cherry hardwood floors. Del Mar Brown Floral Rug (6'7 x 9'6) - 6'7" x 9'6"
Del Mar Green/ Red Colorblock Rug (3'10 x 5'5) - 3'10" x 5'5"
A striking geometric and botanical design area rug in a warm palette of green, red and beige. Featuring a durable yet soft polypropylene construction this beautiful rug will make a wonderful addition to any room. This rug is definitely more of a "brown-brown" rug than a "green-red" rug. The colors are much more neutral and muted than they appeared in the picture. We have no complaints about the quality of the rug - it was well put together - but we were just not too happy with the color, and returned it. 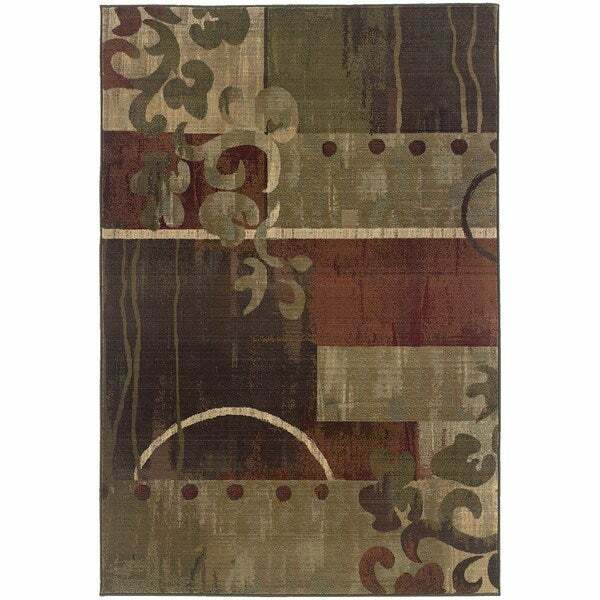 Generations Green/ Red Rug (5'3 X 7'6) - 5'3" x 7'6"
Del Mar Rug (6'7 x 9'6) - 6'7" x 9'6"